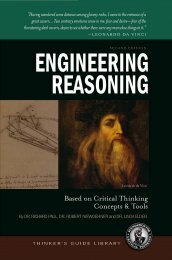 Contains the essence of engineering reasoning concepts and tools. For faculty, it provides a shared concept and vocabulary. For students, it is a thinking supplement to any textbook for any engineering course. This thinker’s guide is designed for administrators, faculty, and students. It contains the essence of engineering reasoning concepts and tools. For faculty, it provides a shared concept and vocabulary. For students, it is a thinking supplement to any textbook for any engineering course. Faculty can use it to design engineering instruction, assignments, and tests. Students can use it to improve their perspective in any domain of their engineering studies. Generic engineering thinking skills apply to all technological disciplines. For example, engineering thinkers are clear as to the purpose at hand and the question at issue. We question information, conclusions, and points of view. We strive to be accurate, precise, and relevant. We seek to think beneath the surface, to be logical, and objective. We apply these skills to our reading and writing as well as to our speaking and listening. We apply them in professional and personal life. Engineers and scientists are quite comfortable working within the context of conceptual models. We employ thermodynamic models, electrical models, mathematical models, computer models or even physical models fashioned from wood or clay. Here we apply a model of the way in which we think, an architecture whose purpose aids the analysis and evaluation of thought, that we might improve our thought. It is important for the field of engineering to be understood as systems of overlapping and interrelated ideas, rather than isolated and different fields of knowledge. Moreover, it is important to recognize and effectively deal with the multiple environmental, social and ethical aspects that complicate responsible engineering. Accordingly, it is time for engineering educators to realize that effective engineering instruction cannot be based on memorization or technical calculation alone. Rather, it is essential that engineering students develop the generalizable critical thinking skills and dispositions necessary for effectively and professionally reasoning through the complex engineering issues and questions they will face as engineers.